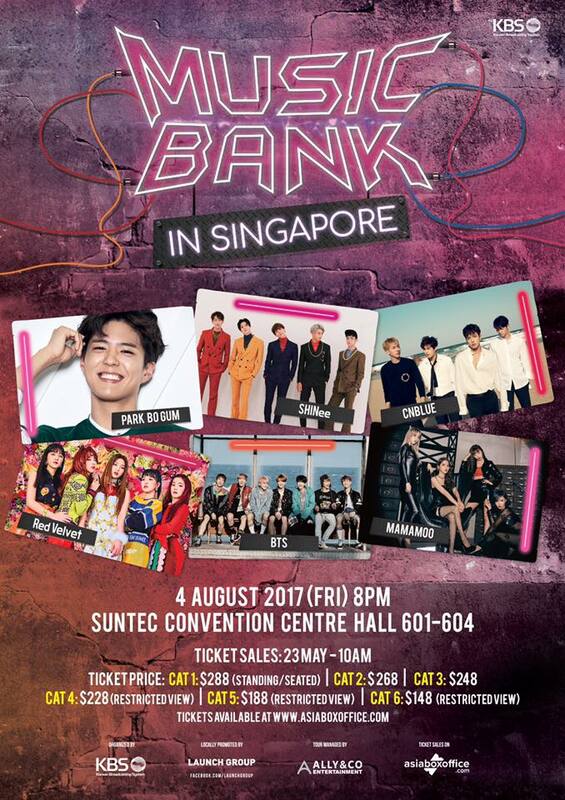 SINGAPORE, 16 MAY 2017 – Fans will be thrilled to hear that KBS has announced that the highly anticipated 10thMusic Bank World Tour will be taking place in Singapore this coming August. Organized by KBS and locally promoted by Launch Group, Singapore is the first stop after two years and the audiences are in for an exciting concert with a star-studded lineup. Hosted by MCs Park Bo Gum and Irene (from Red Velvet), the biggest music live show will kick off at Suntec Convention Hall on 4th August and features a power lineup including SHINee, CNBlue, BTS, Red Velvet and Mamamoo. Tickets will be available on sale 10am onwards on 23 May 2017 via Asia Box Office (www.asiaboxoffice.com). This is one music event you definitely do not want to miss, don’t wait and get your tickets now!